The reality is that the myths such as “Squarespace is bad for your SEO” are exactly that, myths. 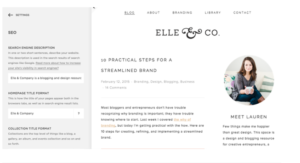 Elle and Company have achieved huge success with Squarespace. Rand Fishkin, SEO Pro, and CEO of Moz Blog has even endorsed Squarespace. There’s no reason why you cannot effectively improve your SEO using Squarespace. Before we get into the specifics of Squarespace, you need to remember the two most important aspects of your SEO. The first is content or on-page SEO. The second is inbound links or off-page SEO. This holds true for any website platform. But not just any type of content, high-value content that solves customers problems. Focusing on specific tweaks to your SEO for organic ranking won’t necessarily deliver the desired results. Google also goes on to say that you should focus on including words in your pages that users will type to find you in the search engine. Blogging is a superb way to regularly provide high-value content to your readers. Blogging consistently will allow you to achieve 434% more indexed pages in Google. Leverage blogging to provide quality content, increased search visibility, and traffic. The quality of your links is the second most important factor to consider. Inbound links are links from another site that point back to yours. Quality links come from websites where its hard for you to feature. You can guest post to try and achieve these links. Alternatively, provide quality content consistently. This increases the chance that quality sites will link back to you. Squarespace optimizes your site by default but here are a few tweaks you can make. Bear In mind that Google ranks specific pages and not entire websites. For Sitemaps to effectively optimize your site, you need to submit them to Google Webmaster Tools. 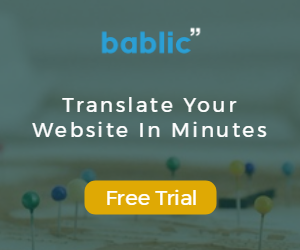 Click here to find your Sitemap. 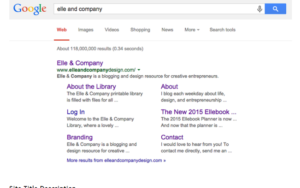 I took a screen shot directly off Elle and Company’s website. It shows how correctly filling out your search engine description in the back-end of Squarespace, has an impact on how you see this in Google. Go to Squarespace Home Menu, click Design – Logo & Title. Through customizing your site title and description you aid search engines in knowing what your sites about. This is one of the most important SEO elements. It appears in browsers, search engine results pages, and external websites. Make sure your page titles are about 55 characters in length to prevent cut off by Google. The same applies for your description which should not exceed 160 characters. A keyword is something that you search for in Google. For example, “Top things to do in South Africa” is a keyword. Description – Despite the many myths about Squarespace SEO it’s highly effective in improving your SEO. Here are several techniques to do this. Consider creating a FAQ page where you address problems/questions consumers are having. Write a few hundred words to answer those questions, including relevant keywords. Through this, you provide content that solves their problems. Remember content is the most important aspect of your SEO. Telling you to focus on using Keywords is one thing, but how do you know you’re using the right keywords? Firstly, be cognizant that popular search terms (e.g. shoes) make up less than 30% of the searches on the web. For Example, Moz Keyword Explorer provides monthly search data, ranking difficulty, estimated click-through-rates and much more. Set the title, which should include your keyword. Standard URL that shows is ugly, change this to be cleaner. Include an excerpt – this substitutes the description visitors will see before visiting the site. Make sure to use tags and categories as search engines scan these to understand your site. Content will always be the most important aspect of your SEO. Focus on providing high-value content, combined with the necessary keywords. Also, consider inbound links. In Squarespace pay attention to Sitemaps and the site, page and search engine titles and descriptions. Also, focus on keywords conduct keyword research using the tools provided. Blogging consistently and optimizing your blog posts will also contribute greatly to improved SEO.